Volume 1 of the Social Skills! series, Sharing and Taking Turns, focuses on a critical component of every child’s socialization – sharing – by modeling appropriate sharing behaviors in a wide variety of scenarios and settings, and by incorporating humor and songs to keep children engaged and provide additional reinforcement. Our goal is to help children find enjoyment in sharing their experiences and possessions with other people. In addition to helping teach children how to share, this video also helps teach children appropriate language to use when sharing (whether to respond to an offer to share or to initiate a request to share). 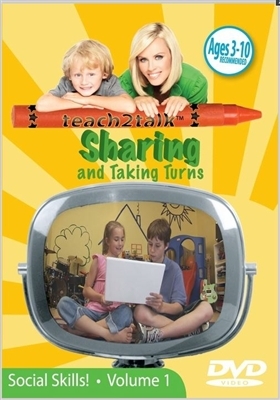 teach2talk’s™ Social Skills! series of DVD videos helps teach children appropriate social behaviors through the use of targeted video modeling. Volume 1 of our Social Skills! series, Sharing and Taking Turns, focuses on a critical component of every child’s socialization – learning to share – by modeling appropriate sharing behaviors in a variety of scenarios and settings, and by incorporating humor and songs to keep children engaged and provide additional reinforcement. In addition to helping teach children how to share, Sharing and Taking Turns also helps teach children appropriate language to use when sharing. This video is appropriate for children of all ages and developmental levels, whether as an introduction to the concept of sharing or as a reinforcer or refresher. Sharing and Taking Turns can also be used as an effective teaching tool in a two-on-one therapy setting by showing the two children a scenario and then pausing the video and asking the children to immediately model appropriate behaviors through role playing. When Evan was younger, he wouldn’t play catch – instead, when someone threw him a ball, he would just throw it behind him. He wouldn’t share or take turns with anyone! After his play skills improved through the use of video modeling, Sarah and I decided to see if video modeling could help Evan learn to share. After watching our video just one time, Evan turned to me, said “Mommy, let’s play ball!” and shared and took turns for the first time! We hope Sharing and Taking Turns will help your child too. Many young children are naturally self–centered and have difficulty sharing their possessions with others; they need guidance to learn how to share. Because many children learn effectively through video modeling, I started experimenting with using it to teach sharing and other social skills. Many of my clients responded well – by first asking me to “practice” the appropriate behaviors modeled for them, and then later by generalizing these positive behaviors to their relations with other children and their families.